St. Marie Paschal told me this story during my trip to see the Benedictines of Mary, Queen of the Apostles. St. Catherine of Siena herself was from a big family! She and her twin sister who did not long survive were the youngest of 25 children. At the age of 7, she made a secret vow to give her whole life to God. Her parents would have preferred that she married, and were fairly upset when she refused, but eventually resigned themselves. St. Catherine entered the Dominican Third order at age 18. She worked tirelessly taking care of the dying and those stricken by the plague. She would eventually influence many through her fearless, warm and often mystically beautiful letters and persistence. She helped lead a crusade, convinced Pope Gregory XI that it was time to return from Avignon to Rome, and died while trying to heal the Great Western Schism. She offered herself as a victim for the Church in its agony and received the stigmata, which only appeared visibly after her death. She died at the age of 33 and is a Doctor of the Church. 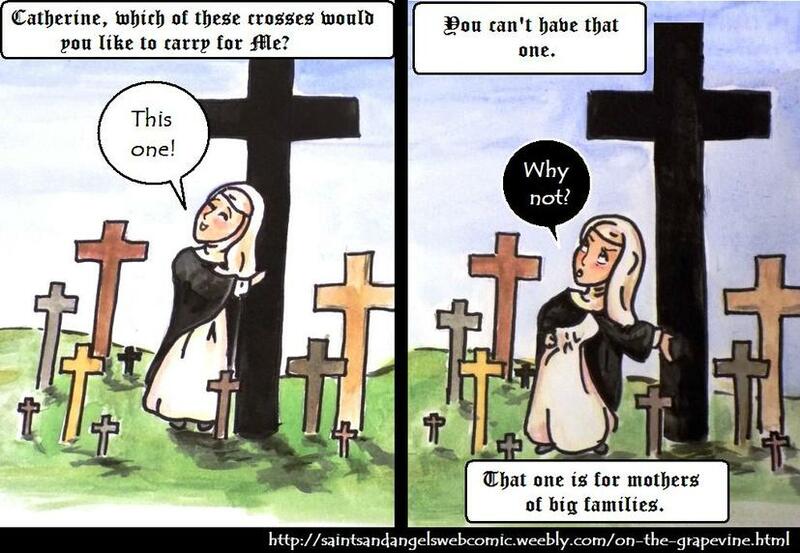 You can read more about her HERE and see our other St. Catherine of Siena comic HERE.